If we separately add up |H| and |h| over the earth surface, which of the sums come out smaller? There is a phrase in the tag description of "ellipsoid" that says "... the geoid, the truer figure of the Earth ..." I am not sure "true" here means less absolute error but I am interested in this question nevertheless. 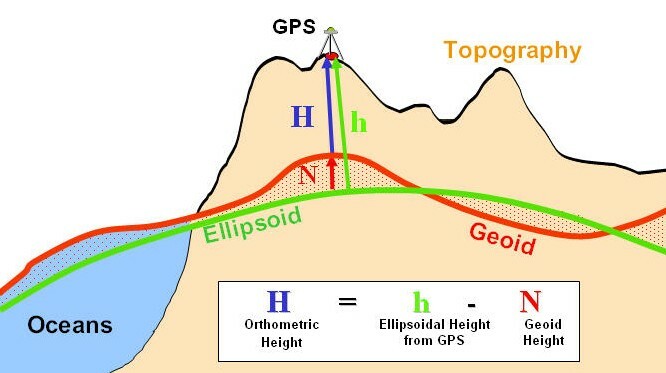 The following passage seems to suggest that the geoid may not approximate the earth surface particularly well in the land areas: "The dominance of the low-harmonic degrees in the geoid power spectrum indicate that the dominant shape of the geoid is controlled by structures deep within the mantle." The answer depends on what you are interested in and therefore what you mean by 'earth's surface'. The Geoid is the equipotential surface (in terms of gravitational potential). The ellipsoid is a geometric approximation of the irregular land-sea (physical) surface. Given the irregularities even in the physical surface, no ellipsoid can ever do a perfect job. On the other hand, the definition of a geoid is clear, its measurement can be improved. Not the answer you're looking for? Browse other questions tagged coordinate-system geodesy ellipsoid geoid or ask your own question. What datum (reference ellipsoid) does Google Earth use? How are EGM96 and WGS84 related to each other?